A Singaporean YouTuber who allegedly posted videos defending paedophilia has had his channel terminated. 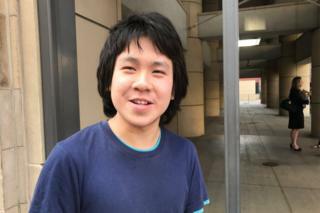 Amos Yee, 19, is currently living in the United States having been granted asylum there. He had previously been imprisoned twice in Singapore over videos that criticised religion and state authorities. His YouTube channel had attracted 40,000 subscribers, according to the South China Morning Post. On Facebook, a post on Mr Yee’s page said: “My YouTube channel and all the videos there have been completely taken down because of my views defending paedophilia.” He also tweeted about the removal. The BBC has contacted Mr Yee for comment. The Sun newspaper reported on 20 April that the US Toy Association, a trade body, had removed its advertisements from YouTube after one of its campaigns had been found on Mr Yee’s Channel. In December, the YouTuber said that he had been asked to leave accommodation near Chicago and claimed this too was because of his views on paedophilia. There are various reasons why a YouTube video or channel may be removed from the site – and YouTube has a series of community guidelines by which its members must abide. “We are very sensitive to any harmful or dangerous content that involves minors,” the guidelines state, however YouTube declined to explain why Mr Yee’s account had been removed when approached by the BBC.